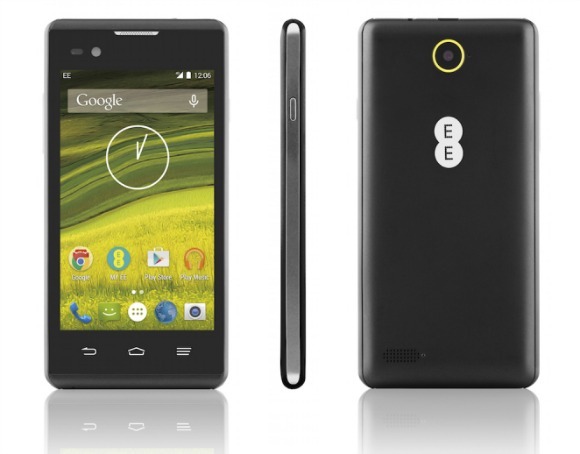 Today EE has unleashed its latest weapon in the war against other UK operators' own-brand smartphones. It's called EE Rook, and it has the honor of now becoming the country's cheapest smartphone that bears 4G LTE connectivity. It is being offered to existing EE customers for just £39 on Pay as you go, while new EE customers will need to shell out £49 for the Rook. EE has launched other own-brand Android devices this year, but none have been quite as low-end as this one. That, however, is understandable, given the pricing. The EE Rook comes with a 4-inch 800x480 touchscreen, a 5 MP rear camera, a VGA front-facing unit, 8GB of internal storage (which is expandable through microSD cards), 1GB of RAM, and a 1,500 mAh battery. It's powered by the MediaTek MT6735M 64-bit chipset, which boasts a 1 GHz quad-core CPU. Amazingly (because of how cheap it is), the Rook runs Android 5.1 Lollipop. Obviously though, you shouldn't expect to see any software updates on this essentially disposable phone. The EE Rook is available now from the operator - online, in stores, and via telesales. EE estimates there's quite a market for it out there, since apparently 44% of people who are on Pay as you go in the UK opt to spend only £50 or less on a phone.